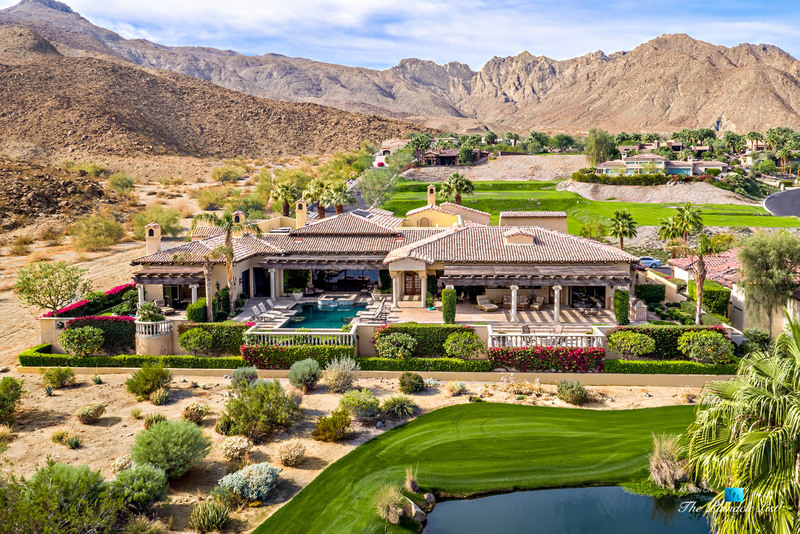 Welcome to the most private gated Golf Estate at The Quarry in beautiful La Quinta, California. This slice of heaven is perched above two ponds on the 4th hole of the short course advantageously positioned to offer the most dramatic views of the city lights and beyond. 4 bed, 6 bath, three separate guest suites with patios, subterranean wine cellar, sophisticated 2 story study, delightful roof deck, 4 fireplaces, 4 car garage. Gated entry with water feature leads to the grand entrance to the great room. Fire place and vaulted ceiling punctuated by large sky lights & private bar flowing to the authentic European terrace offering entertainment areas next to the pool, spa & fire pit. Truly unmatched property that creatively embraces nature, enhanced by a true indoor/outdoor international experience, using only the finest in hand carved stone vessels and baths, granite and marble, custom windows that filter light perfectly, appliances, and only the finest in fittings hardware and mechanics. Offered furnished per inventory.